The purpose of this swap is to make someone's day a little brighter by sending thoughtful surprises, without needing to spend a great deal of money. As with all of our swaps, it's really the thought and quality that count in this one! All group members maintain well-filled-out profiles and meet the requirement of at least a 4.98 rating to join. In the unlikely event that it's necessary, I will angel this swap after you have attempted to contact your partner and honestly rated a "1" for a no-send. You will send your partner 1 envelope of flat profile surprises. The envelope should be delightfully decorated in a theme inspired by your partner's profile (this is the "with flair!" part). 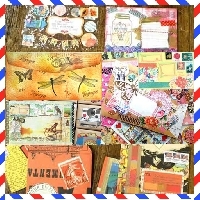 The envelope can be more simply decorated (your partner's favorite color decorated with doodles, washi, stickers, or other images/words reflecting her/his profile interests) or all-out mail art: that's completely up to the sender. While this is a FLAT mail swap, I've listed it as type 3 because of the creative element. Please DO NOT send or expect a package for this swap. Thank you. Items can be used, new, or handmade, but should be in like-new condition. Please send something of a quality you would like to receive. In order to receive a 5, your items should meet the criteria of being related to your partner's profile interests and be thoughtfully put together (only sending a postcard or a quick "hello" note and nothing else does not qualify as being particularly thoughtful). Try to aim for at least 3-5 carefully chosen items for your partner (or make that postage work for you and send more), and send a nice variety! Please rate anyone a 5 as long as they meet these criteria. Hearts are of course at your own discretion. We will have 2 full weeks after partner assignment to put together this swap: please do not sign up if you can't get your envelope ready to send out by the send date.